Hydroseed is the ONLY thing we do! 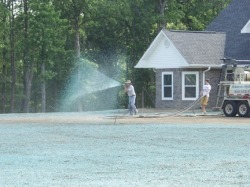 Arkansas HydroSeed is the oldest and most trusted hydroseed contractor in Arkansas. Seeding is not just something we do, it's the ONLY thing we do. We have handled jobs from 5,000 sq ft to 70+ acres. Our clients include real estate developers, general contractors, utility contractors, golf courses, government agencies, military facilities, and home owners. Hydroseeding is becoming a popular means of planting grass due to its relative ease of use and effectiveness. Hydroseeding is a process by which seed, water, fertilizer, fiber mulch, and tackifier are blended together in a tank and applied onto a prepared lawn area through a spraying hose or tower gun. Once sprayed, the wet fiber mulch will help create a bond to the soil and provide the seeds with a water retaining blanket while protecting it from rain, wind, and erosion. As the grass seeds begin to germinate, the fiber mulch will slowly decompose adding nutrients to the soil. Hydroseeding is the fastest, most cost effective and highest quality method of seeding lawns, landscapes and other erosion control applications.